In the Mishnah joint owners are known as "shuttafin." When the joint owners are coheirs the Mishnah speaks of them as "the brothers"; but the relation arises apart from common descent, as when two or more people make a purchase in common, or when a sole owner sells shares in his land or chattels to another. For cases in which some of the joint owners desire a division, against the wish of the others, the Mishnah (B. B. i. 6) lays down this principle: "Whenever the several parts, after division, are great enough, so that each of them can bear the name of the whole, any part-owner is entitled to claim a division; otherwise not; but a sacred book can not be divided, though all the owners be willing." Thus a courtyard for two or more houses should not be divided unless large enough to leave four cubits square for each part. The smallest field deserving of the name would be sown with nine cabs of grain, which, according to the commentators, would mean an area of 3,750 square cubits, or 6,666⅔ square feet; a garden must have for each share an area enough for half a cab of seed; similarly a dining-hall, or a dove-cot, or a bath-house, or an irrigation sluice, or an oil-press, or a shawl. In the Gemara (B. B. 12a) the minimum of an orchard ("pardes") is fixed at the area for three cabs of seed. But all these measurements are meant for Palestine; in Babylonia a field for each part-owner must be large enough for one day's plowing, and an orchard or vineyard must be sufficient for thirty-six trees or vines—as many as one man can dress in a day; and these greater limits were generally recognized in the countries of the Diaspora (Shulḥan 'Aruk, Ḥoshen Mishpaṭ, 171, 3). It is the opinion of some rabbis (ib. 171, 4-5) that if a part-owner has land adjoining the land held in common, he can be compelled to divide, though his share of the latter by itself would be below the minimum; also that the part-owner can not be compelled to take a share which has no other outlet than over the share of a companion. When the rule of partition applies as above any joint owner can call for its enforcement, no matter how the joint ownership arose. Where the land is all of the same quality and can be partitioned by measurement alone, a part-owner who has an adjoining field may ask that his share be laid off next to that field, and it must be done; but if there are countervailing qualities (e.g., one part being nearer to the river, another having better soil) each owner must be satisfied with what the lot gives him, and none has a right tochoose. According to later authorities, in case of need a division in which the quality of the land is taken into account may be made by three unlearned men, provided they are known to be men of integrity and well acquainted with land-values. The first-born son gets his double share in one continuous tract, and so does one of several purchasers of land who has a share twice as large as any of the others. But one who has bought out another part-owner must be satisfied to have the old and the newly bought share both assigned by lot, and take the chance of their being together or apart. So the "yabam" (a brother who has taken his childless brother's widow to wife, and whose eldest son by her is heir to the dead brother's share) must draw separately for his own and for his son's share. When the land is flanked on two sides by a river, and on the other sides by roads, it should be cut diagonally so as to give, as far as possible, to each part-owner access to the river as well as to the roads (Maimonides, "Yad," Shekenim, xii. 1-3, following B. B. i. 6). 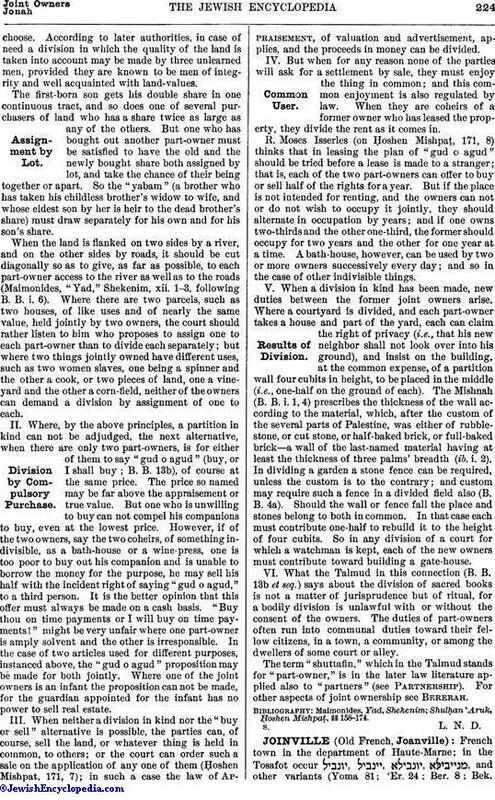 Where there are two parcels, such as two houses, of like uses and of nearly the same value, held jointly by two owners, the court should rather listen to him who proposes to assign one to each part-owner than to divide each separately; but where two things jointly owned have different uses, such as two women slaves, one being a spinner and the other a cook, or two pieces of land, one a vineyard and the other a corn-field, neither of the owners can demand a division by assignment of one to each. II. Division by Compulsory Purchase. Where, by the above principles, a partition in kind can not be adjudged, the next alternative, when there are only two part-owners, is for either of them to say "gud o agud" (buy, or I shall buy; B. B. 13b), of course at the same price. The price so named may be far above the appraisement or true value. But one who is unwilling to buy can not compel his companions to buy, even at the lowest price. However, if of the two owners, say the two coheirs, of something indivisible, as a bath-house or a wine-press, one is too poor to buy out his companion and is unable to borrow the money for the purpose, he may sell his half with the incident right of saying "gud o agud," to a third person. It is the better opinion that this offer must always be made on a cash basis. "Buy thou on time payments or I will buy on time payments!" might be very unfair where one part-owner is amply solvent and the other is irresponsible. In the case of two articles used for different purposes, instanced above, the "gud o agud" proposition may be made for both jointly. 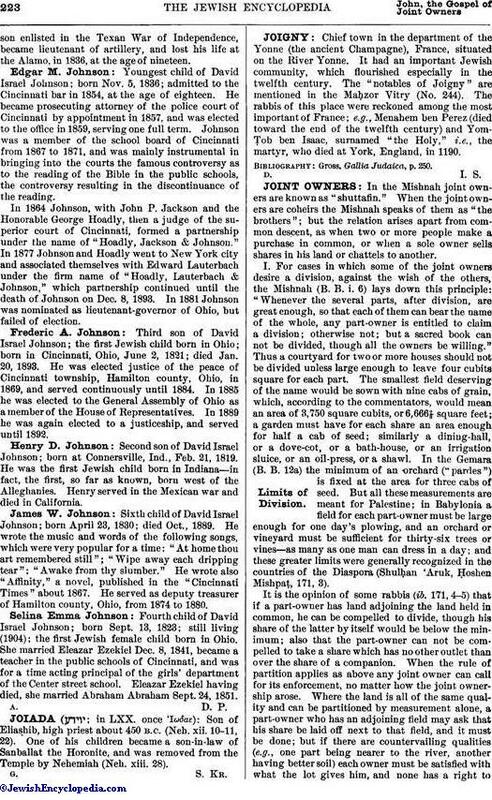 Where one of the joint owners is an infant the proposition can not be made, for the guardian appointed for the infant has no power to sell real estate. When neither a division in kind nor the "buy or sell" alternative is possible, the parties can, of course, sell the land, or whatever thing is held in common, to others; or the court can order such a sale on the application of any one of them (Ḥoshen Mishpaṭ, 171, 7); in such a case the law of Appraisement, of valuation and advertisement, applies, and the proceeds in money can be divided. But when for any reason none of the parties will ask for a settlement by sale, they must enjoy the thing in common; and this common enjoyment is also regulated by law. When they are coheirs of a former owner who has leased the property, they divide the rent as it comes in. R. Moses Isserles (on Ḥoshen Mishpaṭ, 171, 8) thinks that in leasing the plan of "gud o agud" should be tried before a lease is made to a stranger; that is, each of the two part-owners can offer to buy or sell half of the rights for a year. But if the place is not intended for renting, and the owners can not or do not wish to occupy it jointly, they should alternate in occupation by years; and if one owns two-thirds and the other one-third, the former should occupy for two years and the other for one year at a time. A bath-house, however, can be used by two or more owners successively every day; and so in the case of other indivisible things. When a division in kind has been made, new duties between the former joint owners arise. Where a courtyard is divided, and each part-owner takes a house and part of the yard, each can claim the right of privacy (i.e., that his new neighbor shall not look over into his ground), and insist on the building, at the common expense, of a partition wall four cubits in height, to be placed in the middle (i.e., one-half on the ground of each). The Mishnah (B. B. i. 1, 4) prescribes the thickness of the wall according to the material, which, after the custom of the several parts of Palestine, was either of rubble-stone, or cut stone, or half-baked brick, or full-baked brick—a wall of the last-named material having at least the thickness of three palms' breadth (ib. i. 2). In dividing a garden a stone fence can be required, unless the custom is to the contrary; and custom may require such a fence in a divided field also (B. B. 4a). Should the wall or fence fall the place and stones belong to both in common. In that case each must contribute one-half to rebuild it to the height of four cubits. So in any division of a court for which a watchman is kept, each of the new owners must contribute toward building a gate-house. What the Talmud in this connection (B. B. 13b et seq.) says about the division of sacred books is not a matter of jurisprudence but of ritual, for a bodily division is unlawful with or without the consent of the owners. The duties of part-owners often run into communal duties toward their fellow citizens, in a town, a community, or among the dwellers of some court or alley. The term "shuttafin," which in the Talmud stands for "part-owner," is in the later law literature applied also to "partners" (see Partnership). For other aspects of joint ownership see Bererah. Maimonides, Yad, Shekenim; Shulḥan 'Aruk, Ḥoshen Mishpaṭ, §§ 158-174.